Grilled Pepper Pasta Salad, Thyme for Cooking healthy summer salads. Grilling peppers and onions adds a layer of sweetness not found with simple frying. If you don't do them on the grill, roast them on a baking sheet in a 400F (200C) oven for 30 minutes, stirring once. They should be just slightly crispy around the edges in spots when done. 1 cup (3.3oz, 95gr) bite-size pasta - penne, fusilli, etc. When pasta is done drain well, rinse briefly with cold water, drain well again, and put into a large bowl. Slice peppers and onions thickly. 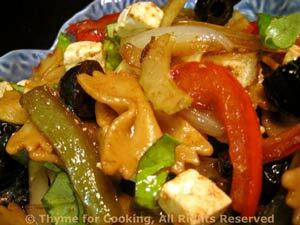 Put olive oil and Balsamic vinegar in a large bowl, add peppers, onions, and toss well to coat. Cook over medium heat on barbecue grill for 10 - 15 minutes, until they have a nice color. Snip large basil leaves, leave small ones whole. Slowly drizzle in olive oil, whisking constantly until thick. Add peppers, onions, celery, basil, olives, feta and vinaigrette to pasta. Toss gently to combine.